New players only. 10 Free Spins sign bonus is on Starburst available. Max conversion 4x. No deposit required. 100x wagering. SMS validation req. Subject to Planetfruity's Bonus policies and terms and conditions apply. There have been several excellent slots released by Caddell Ltd N.V in recent years, so it’s no real surprise that Nektan, the leech of the online casino industry, has attempted to take full advantage of the popularity of their slots. Combining the names of two of Caddell’s most popular slots, Fruity Casa and Slot Planet, Nektan have created Planet Fruity, a site that has none of the charm of either. What those two sites offer that Planet Fruity does not is originality, and the feeling that some level of effort has been put into the creation of them. Nektan have made something of a career out of putting the least amount of work possible into creating as many online casino sites as possible. While other operators may take the time over a site to ensure it is of sufficient quality to at least be appealing to some online casino players, Nektan release an endless stream of below par sites in the hope that quantity will be enough to at least accidentally get a few players to their sites. The barrage of mediocrity that comes from Nektan has been relentless over the last few years, and based on what we’ve seen in 2018 already, Nektan aren’t slowing down, and seem to have no intention of changing their strategy. To the credit of Planet Fruity, this site is actually slightly better in terms of design than most of its network siblings. 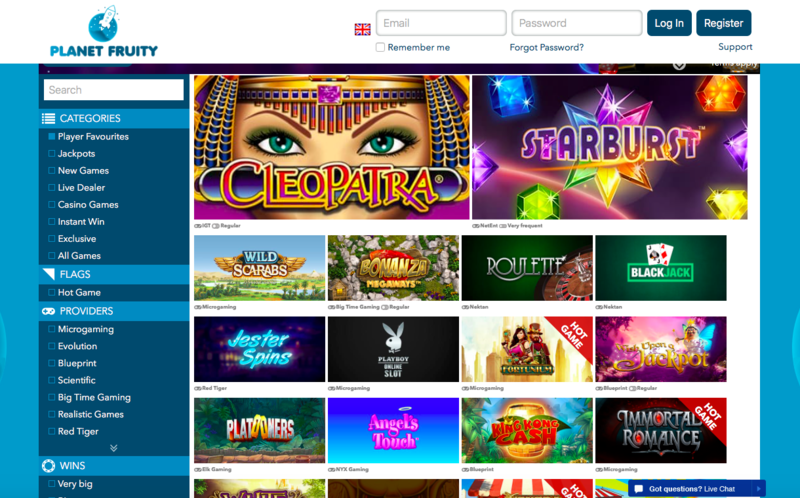 The design covers the whole page, for example, which is rare for a Nektan site, but at the same time, the fact that the designers actually took the time to colour in the whole site doesn’t exactly set Planet Fruity apart from any online casinos apart from those on the same network. A blue colour scheme with the traditional awful logo and simple banner design greets you when you land at Planet Fruity, and that’s about it. The background, which has a few planets visible behind the thumbnails on the homepage, is actually not that unattractive, which is a start, but again, casino players expect a lot more that “not terrible” when it comes to their favourite online casinos. Planet Fruity, similarly to another recent addition to the Nektan portfolio, Slotsino, shows a step in the right direction from Nektan in terms of design, but a small one, and it will take many more similar steps before sites on this network come close to the giants of the industry that they should, on paper, at least be attempting to compete with. Nektan sites do tend to have pretty impressive game collections, and that’s the case here as well, with titles at Planet Fruity coming from a tempting list of developers that includes 1X2 Network, Aristocrat Gaming, Betdigital, Big Time Gaming, Blueprint Gaming, Core Gaming, edict egaming, ELK Studios, Evolution, Extreme Live Gaming, Felt, Gamevy, IGT, IWG, Microgaming, Nektan, NetEnt, NextGen Gaming, Realistic Games, Red Tiger Gaming, SG Digital, SG Gaming, Spin Games, and Williams Interactive. Is that enough? Probably not, to be honest, but if you are a player who focuses purely on games, then the mix of classic slots, video slots, jackpot slots, live dealer games, table and card game options, and more may just be enough to make you forget about the general dismal nature of this site. Planet Fruity is undoubtedly a much needed step in the right direction from Nektan, but unfortunately, it only serves to show how many more steps are necessary before sites on this network become in any way interesting for players. Yes, the games selection is good, but that’s also true at many superior online casinos.